Randy is the favourite character of John DiMaggio, his voice actor. In "Crimes of the Hot" and "Proposition Infinity", he oddly has mahogany hair and wears a sailor cap. It is possible this is another character with a similar voice as they have differing facial features. He is not referred to by name in an episode until "Overclockwise". However his name was revealed in earlier commentaries and his full name appeared in the earlier comic "Who's Dying to Be a Gazillionaire?". 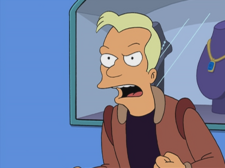 Bender: I SAID, "DO IT!!" This page was last edited on 17 September 2017, at 23:51.